What sets Globetops apart from your typical charity? Glad you asked! The primary difference is that Globetops provides donors with the ability to CHOOSE where their laptop goes. They can pick the country, the project and even the exact person they’d like to support. Most of the time when we donate money or goods, we never get to see what happens on the other end. Who has that second pair of shoes I paid for? Who is wearing the t-shirts I gave to the thrift store? I don’t know! With Globetops, the donation process is transparent. Both donors and recipients are afforded with the opportunity to meet each other, to learn about each other’s culture and to connect with someone in a another part of the world. This blog post marks the beginning of our featured gallery, where we will be highlighting projects that have been laptopped and the difference having a computer has made. Our first profile focuses on school principal Mariama Bangoura in Kindia, Guinea. Mariama, a principal at the primary public school in the Ferefou section of Kindia is responsible for over 600 children, and due to the lack of computers, all school operations for both teachers and students are done by hand, on paper. Having a computer desk at school, to many, seems less like a luxury, and more like a given. Not for Mariama. She used to spend days calculating students grades and entering them in a book by hand. After looking at numbers for so many hours, her eyes got blurry and she made mistakes. Then she would have to go back and recheck the grades and do calculations over again. All of the time spend on calculating was time she was not available to be a leader to the school. Mariama has a big vision for her students and the future of Guinea! But she was bogged down by paperwork. 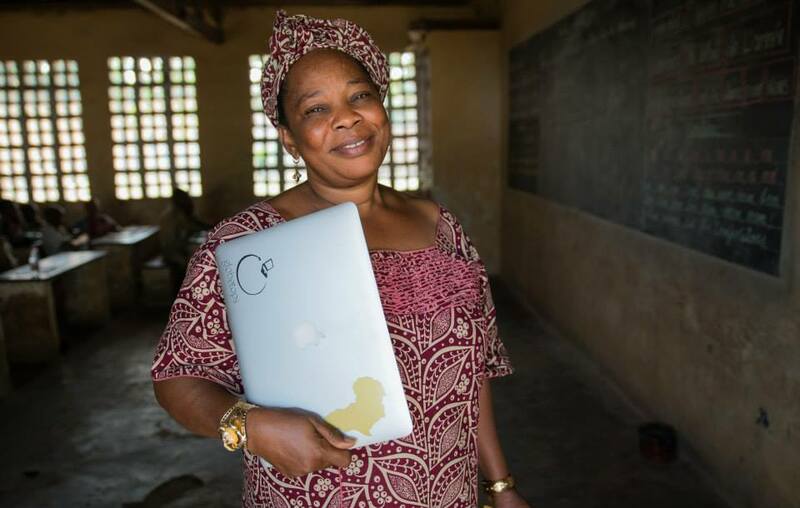 Once Mariama received her new MacBook Air courtesy of Adam Reid, she can now can let the computer do the calculations! That time saved is time that she can devote to supporting her students expanding the school’s curriculum. Another thing Mariama used to do by hand was take attendance. With so many students and so many papers it was difficult to keep track of who was actually coming to class. Being able to keep track of attendance on a computer means that Mariama can spot when students aren’t present and can follow up their families to find out why they are not going to school. Now that Mariama can do that less students are falling through the cracks. To read this amazing woman’s full story and find out information on her donor, click here.